Chairman Sports Authority of Arunachal Bamang Tago inaugurates 1st ever Kamle District Football tournament at Raga football stadium. While attending the 1st ever Kamle District Football tournament at Raga football stadium here today Chairman Sports Authority of Arunachal (SAA) Bamang Tago disclosed that “Annual State Sports Award” conceptualised by Minister Sports & Youth Affairs Dr Mohes Chai shall be organised every year to recognise and honour the Sports personalities and promoters in seven entities which includes, 1. Sports Association of the Year, 2. Best Sport Organiser of the year, 3. Coach of the year, 4. Player of the year (Men & Women ) 5. Sports Administrator of the year, 6. Life time Sports Achievements Award’ for promoting Games & Sports in the state and 7. Sport supporting staffs of the year. This unique program have been designed to encourage all stakeholders for development of games & sports across the state aiming to produce and compete national & international standard of players and bring laurel for the state in days to come. Tago appealed the parents, elders and all stakeholders to encourage the youth to opt sports professionally. Congratulating Kamle District Football Association for conducting the event Tago said such initiative will inspired and motivate the rural youth paving way to explore their hidden talent and appealed the participating teams to maintain sportsmanship spirit throughout the tournament. 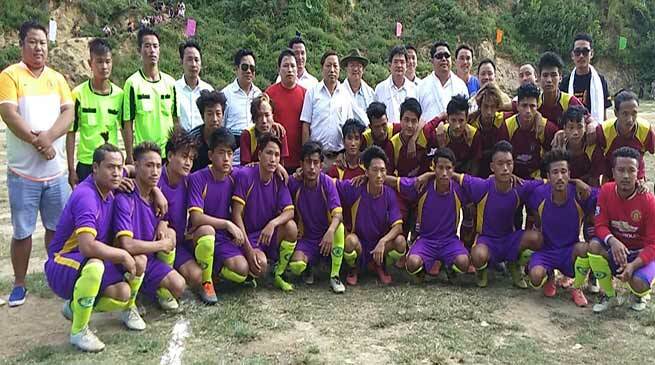 Arunachal Pradesh Football Association Secretary Kipa Ajay appreciated the Kamle District Football Association for hosting the 1st ever District League. He also claimed that Arunachal Junior U-16 football team has landed in national stage which proved the potential of the youth and confident that sooner or later Arunachal will continue to participate in national and international events in years to come and als appealed all stakeholders to encourage women in sports. Kamle District Deputy Commissioner, Mingki Loye also appreciated the KDFA for organizing such league despites many shortcomings and appealed youth, senior citizens and elders of the district to cooperate with District administration for reformation of all round development of the district. As much as nine teams from the district base Football clubs are taking part in the ensuing League. Boa-Simla FC defeated their closed rival Muri-Mugli 5-1 in the opening match. Earlier, President, KDFA Bini Tare welcomed the dignitaries and participants.